Keeping up with the trend of recent years, Victorian players dominated the 2012 Australian Youth Championships. Along with performing well, Victoria was the best represented state with 12 players making the trek to Canberra (there were 10 teams in the main event). Of these 12 players 2 were from the Juniors club (6-15 year olds) that started up in term 4 of 2011. Liam and Aiden, aged 11 & 8 respectively took on the championships, Aiden is half the age of the next oldest competitor! 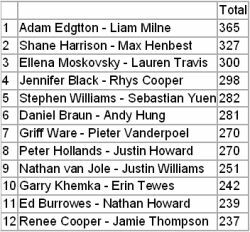 The Pairs Championship was won by Adam Edgtton and Liam Milne by a fair margin. The teams was won comfortably by the very strong Edgtton Teams which won with a handy margin. 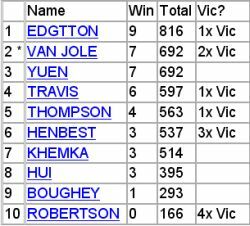 Van Jole snuck home in 2nd Place form Yuen in 3rd when a 4 Board Playoff was required after they tied. And then there were the Australian Butler Youth Finals.. The Youth Butler to decide the Australian Youth Squad was a long and keenly fought competition. 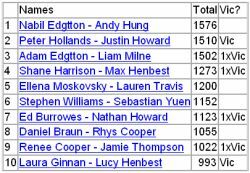 Pairs 1-3 automatically qualified for the 2012 Australian Youth Squad. Pairs 4-7 played off for 2 other places on the squad. This trophy, donated by Richard Hills and Steve Hurley, is intended to encourage talented young bridge players to form long-standing partnerships and reward a successful pair who has developed a well-organised partnership to harness their full potential. 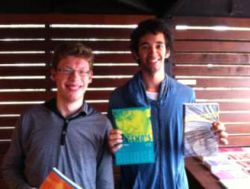 In 2011 Sebastian Yuen and James Higgins have continued their partnership of several years contesting various national youth and open events together with a number of strong performances on their local Canberra scene. Highlights in 2011 included: 1st in the World University Online Championships, 2nd in the National Youth Teams, top youth team in the South-West Pacific Teams, 6th in the Victor Champion Cup, 2nd in the ANC Interstate Youth Teams and qualifying to represent Canberra in the GNOT. Whilst not the most successful youth partnership in 2011, they clearly fulfill the intent of the award based on the enduring nature of this partnership and the significant amount of ongoing work on system development and practice. This award, worth $200 annually and this year supplemented with a further $100 from the Friends of Youth Bridge Fund, is awarded to the Australian Youth Player who earns the most masterpoints in the calendar year in question. This year Andy Hung won with 248.61 masterpoints which included 2nd in the National Open Teams and a string of victories and strong finishes in congresses and state events in Queensland (most notably winning the four major pairs championships). This newly established award is granted to the best performed pair in the primary target international event taking account of performance in the event itself, commitment to preparation and contribution to team success. Daniel Braun and Shane Harrison anchored the Australian Under-21 team to its victory in the Asia Pacific Bridge Federation Championships in Kuala Lumpur, Malaysia in June 2011. Playing 22 of 25 matches their contribution was clear based on a commendable +0.36 imps per board against datums. Away from the table they strongly supported their teammates with unwavering positive energy in the face of adversity in the first round-robin and were well prepared having practiced extensively on BBO under the mentorship of Nabil Edgtton in the months leading up to the event. This award, worth $400 annually and this year supplemented with a further $200 from the Friends of Youth Bridge Fund, is presented each year to the Australian Youth Bridge Player whose ability, achievements, sportsmanship, attitude, contribution and commitment during the calendar year are most deserving. The 2011 award was won by Laura Ginnan, who has been active in teaching in schools, establishing and operating a primary school GATEWAY programme, establishing and maintaining the VicYouth Facebook page, setting-up a weekly under 16s youth session in Melbourne, assisting with the regular Melbourne youth session, running a university bridge crash course and convening the ABF Youth Triathlon. At the table Laura’s 2011 results included: 2nd in the National Youth Teams, 2nd in the ANC Interstate Youth Teams, 6th in Victor Champion Cup, 3rd in the Victorian Open Pennant and 1st in the GNOT Swiss Pairs. Both Helman-Klinger Awards exist due to the generosity of Rabbi Helman, an American lawyer, prominent bridge enthusiast and philanthropist, who made a substantial donation to establish the prizes to honour Ron and Suzie Klinger’s outstanding contribution to bridge in Australia. For the second year running, Andy Hung has been a close second in the voting for the Helman-Klinger Achievement Award and in light of Andy’s outstanding contribution to youth bridge over many year a decision was taken to grant a Special Recognition Award. Andy is extremely generous with his time in mentoring and supporting up and coming youth players through BBO practice and speaking with young pairs at tournaments. In 2009 Andy spent many hours with Sam Schulz and Shane Harrison taking them from a relatively unknown pair to our top Under 21 pair in 2010. Andy has been a regular fixture on Australian representative teams since 2006 when Australia had its best performance in a World Championship at any level in 15 years making the semi-finals in the Under-21s at the World Youth Team Championships in Bangkok. Andy’s Under-26 international successes include quarter-finals in the 2008 and 2010 World Youth Team Championships and victories in the 2007 and 2010 Asia Pacific Bridge Federation Championships. Andy has forged close ties with youth players in Europe which has been invaluable in bringing new ideas and techniques to Australia’s youth programme. Andy’s connection to the European youth scene has attracted Alex Smirnov to the last two Australian Youth Weeks and Summer Festivals and helped secure Alex’s services as Australian youth coach for 2012. Andy also set up a youth bridge website on which he posted regularly and which contributed to a more friendly, fun and unified youth scene in Australia.